This week saw International Nuclear Services (INS) employees volunteering to undertake a beach clean at Walney Island. INS, and their subsidiary company Pacific Nuclear Transport Ltd (PNTL) have been based in Barrow for over 40 years. They were keen to give something back to the community and helping keep Barrow’s beaches safe and clean seemed an ideal opportunity to help. Despite the windy conditions the team were able to pick up and remove around 10 bin bags of plastic and waste from the beach. 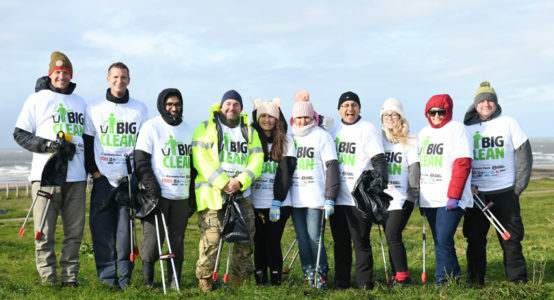 “We enjoy a longstanding relationship with the Barrow community and as a shipping company the sea is close to our hearts so we jumped at the chance to help remove rubbish from one of the local beaches. It was also a chance for the team to work together in a different environment and it was an enjoyable experience”. INS has successfully completed around 200 shipments of nuclear materials around the world from its home port in Barrow and is now recognised as the world’s most experienced shipper of nuclear materials. Since 1975 it’s specialist nuclear vessels have safely covered over 5 million miles and can boast a flawless nuclear safety record. INS now uses the vast nuclear transport skills and experience they have built up over this time to play a key role in support of UK decommissioning and international nuclear security goals.